On April 24th, we encourage congregations to join Water Mission for Water Sunday. Each year, churches across the country rally together to bring awareness to the global water crisis and to raise funds to bring relief to those who need it around the world. Water Mission provides all the resources and supplies you may need to participate in this event: everything from sermon notes, small group discussion questions, children’s activities, posters, and videos. They’ll even provide water bottle wrappers if you’d like to participate in a beverage fast, and resources to host a walk for water. As the church body, God is able to reconcile brokenness through our efforts. As we reach out to our brothers and sisters that lack clean drinking water, we are able to show them the love and the grace of Our Father. It is our responsibility to step into the brokenness and be God’s hands and feet as He reconciles all of creation. Water Sunday | 2016 from Water Mission on Vimeo. During a trip to Uganda in January, the Water Mission team visited a community called Busalamu. This project received safe water a year ago thanks to a church in the US dedicating a month to Water Sunday and raising funds to move the project forward. During a meeting with the members of the Safe Water Committee, joy radiated from their faces. One lady named Sumaya stood up and shared how three of her daughters were raped and got pregnant when they used to walk a mile in the dark to collect water from a swampy area. Now, thanks to the safe water project, her daughters are healthy and safe and she makes some extra money as a tap operator which allows her to better support her family. Sumaya even showed us her skin and proudly exclaimed how it was “shining and beautiful” because they now have accessible water to bathe regularly and since it’s safe, they no longer get skin diseases. Sumaya closed in a posture of thanks, kneeling on the ground, expressing her gratitude. The lives of her family and entire community of nearly 4,000 people have been transformed. Your participation in Water Sunday is what makes stories like this possible! We encourage you to join the rally of believers across the country this Water Sunday in an effort to provide clean drinking water and ultimately, the Living Water. 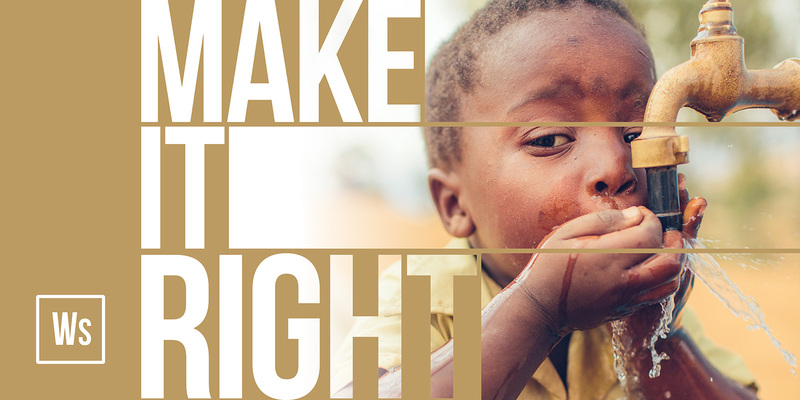 Now is the time to make it right. Visit www.watermission.org/watersunday to learn more and register your event. You will instantly receive all the digital resources and physical resources will be mailed including an event t-shirt, (2) 11×17 posters and as many water bottle wrappers as you need.